The French fingerling is a petite, sleek and slender heirloom potato. Its rose colored skin is thin and smooth. Its flesh, creamy yellow and splashed with pink, is succulent, firm and waxy. Thin delicate skin doesn't need to be peeled. It has a robust, nutty, earthy and buttery flavor when cooked. Use in salads, baked, fried, mashed or boiled. 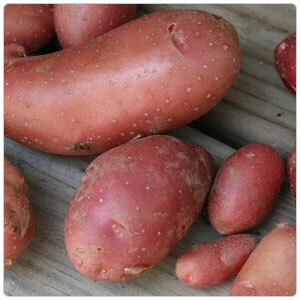 Some people confuse fingerling potatoes with new potatoes, which are young potatoes harvested before they fully mature. While young potatoes and fingerling potatoes share a small size and thin skins, fingerlings have a more complex flavor, and they are fully mature. Just as is the case with regular potatoes, fingerling potato farmers allow the green upper portion of the plant to die back before harvesting fingerling potatoes.